Spa Varee, one of the most renowned and elegant spas in busy Patong Beach, has expanded into an open plan concept which allows guests to relax in a traditional Thai village atmosphere that has been renovated to support one of Phuket’s most interesting and relaxing spas. Varee in the Thai language is a word for water. Every traditional Thai village was located on a river which gave easy access for water for the rice fields and as a road for transport. Spa Varee has given the blessing of water to this upscale new treatment centre with the sounds of cascading water running down walls of the comfortable air conditioned new treatment rooms designed to celebrate Thai culture. All around are beautiful images of traditional Thai life which help guests relax and prepare for the wonderful therapy choices. There are also two massage rooms that are set up in the air on stilts just like in a small village where people live above the ground for both protection and to catch the cool favourable winds. Massage therapists at Spa Varee have been trained in the skillful use of Thai herbs, fruits and spices, which, when combined, have a therapeutic effect on improving health and general well being. Spa Varee has developed their own combination of therapies to suit the needs of every guest. From stress reduction to enhancing energy, the aromatherapy oils are carefully blended for each guest. For those suffering from depression or anxiety, a combination of bergamot, grapefruit, lemon, orange and peitgrain are combined and added to a base of almond oil. For those who need enhanced energy, a combination of cedarwood, lavender, orange, pine and rosemary is offered. Spa Varee is situated at the front of the Patong Beach Hotel, conveniently located for those wanting a break from the strong midday sun. The Spa offers the ultimate in pampering luxury with packages of spa treatments that combine pleasure and therapy. Guests can choose from a selection of body scrubs to remove unwanted skin cells followed by a choice of massage. Traditional Thai massage, aromatherapy oil massage and even Indian Ayurvedic treatments are on the menu. The Spa Varee Package is two hours of delight beginning with a sauna or steam followed by an aromatherapy oil massage. 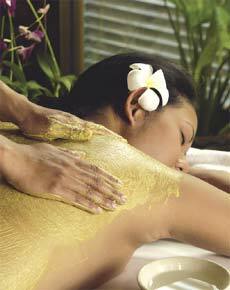 A body scrub with Thai herbs is then applied to smooth and refine the skin and finishes with a softening moisturizer. Spa Varee is an oasis of peace and healing in the middle of exciting Patong Beach. A visit is like a journey back to the ancient villages of Thailand and will leave you feeling relaxed and refreshed.